I was in the midst of preparing a very rich meal. I had two plump chickens roasting in the oven, a pot of rice simmering in garlic chicken broth on the stove, and a bowl of sliced leeks ready to add to the saucepan of chanterelles I was stirring on the front burner. I wanted a salad to round out this meal, and I wanted it to be assertive and bright. Something explosive, with strong, clean citrus juiciness to complement the chicken and mushrooms. I grabbed one of each kind of citrus fruit I had in the house, and a large fistful of mint. I added lots of radishes for crunch, and some scallions for flavor, and I got to work. Time to slice and chop. 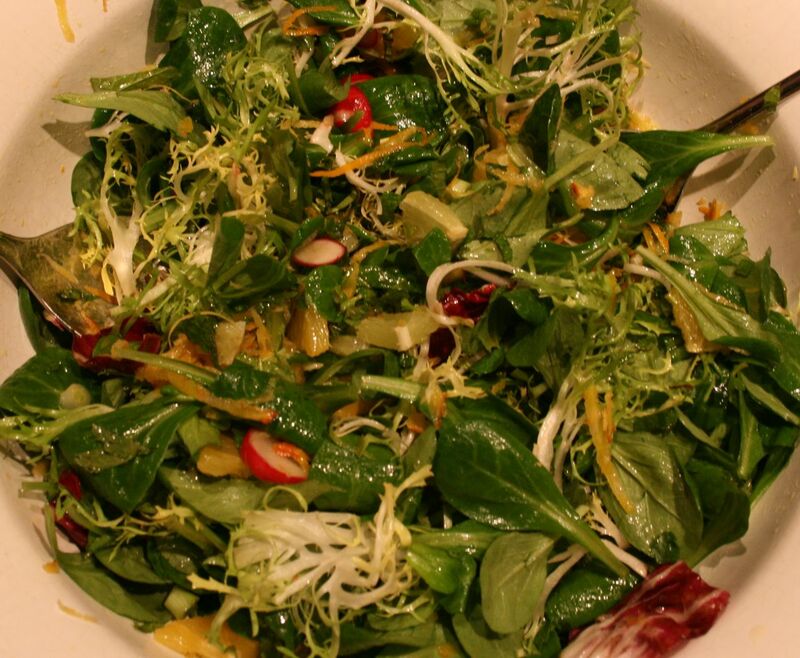 A bed of greens, ready for the triple citrus zest. 4 cups of mache and mixed greens, including frisee and radicchio. 1/2 cup of grated golden beet. 1 navel orange, peel sliced off, quartered and sliced. 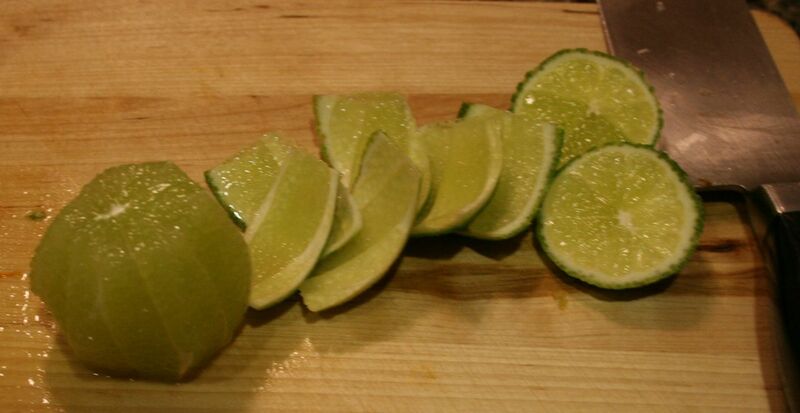 1 lime, peel sliced off, quartered and sliced. 1 small clove of garlic, crushed and minced. The orange peel is sliced off, and the lime is in step one of peel removal. 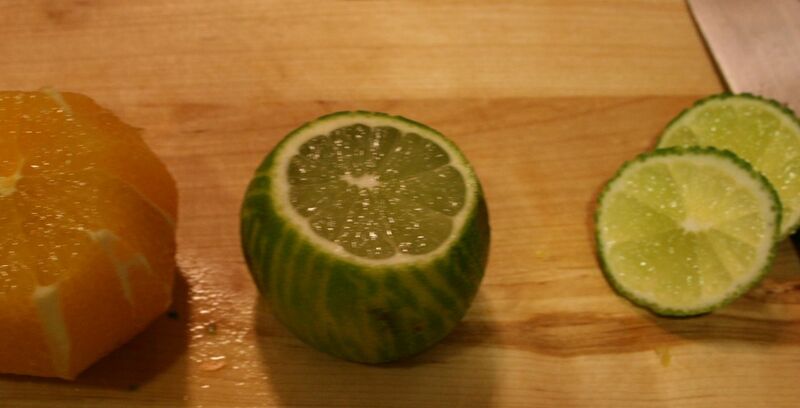 The lime peel is now completely sliced off. I started with a gorgeous bed of mache, radicchio, and frisee. 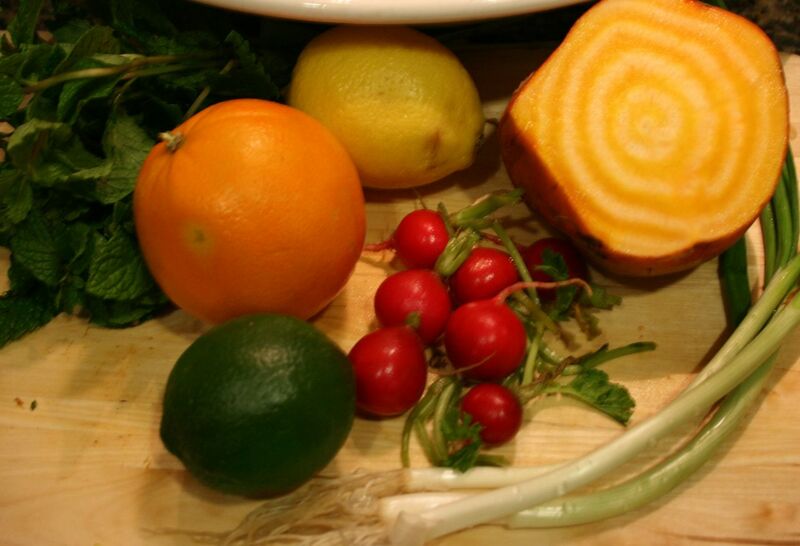 Then I zested the citrus over the greens. 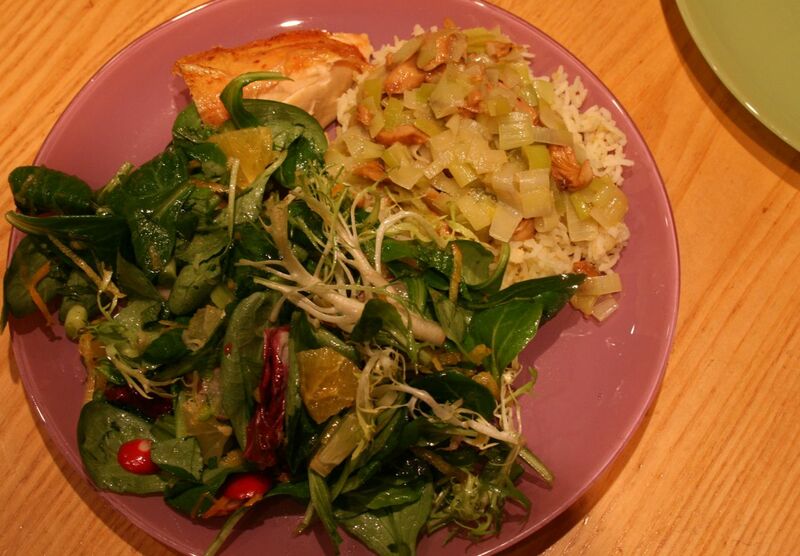 Once the zest was safely in the salad, I juiced a lemon and prepared my citronette, giving the garlic time to mellow. I sliced up my radishes and scallions, and turned to the lime and the orange. I love slicing the peel off of citrus fruits and exposing the bright, jeweled fruit. I did this for the lime and the navel orange, and added them to the salad just before it was time to serve it, since mache wilts easily. This salad was exactly what I wanted. My verdict? Amazing. It was quite sour, which I loved. My husband, on the other hand, was less impressed. He wound up leaving a little pile of pretty lime bits on his plate, and it was far too sour for the kids. Make this if you’re a fan of sour deliciousness. If not, move on. Garbanzo beans, chicken, or any kind of seafood would work very well with this salad. Citronette in a jar with all the cut fruit. The rest of the salad ingredients in a large glass or stainless steel container with a tupperware-style lid. 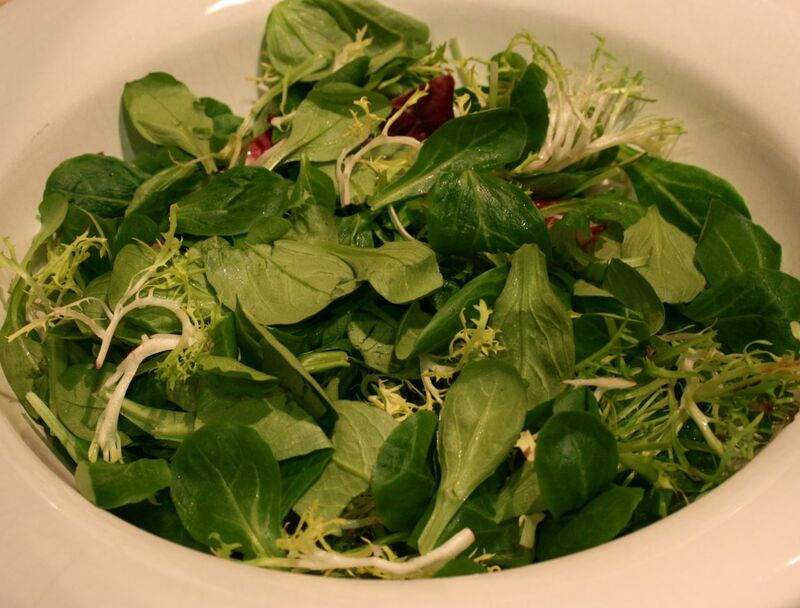 Shake up the dressing and pour as much as you need over the salad before eating it.